Random question but do you know the collective term for nieces and nephews? Apparently there isn’t one but the Urban Dictionary defines “Niblings” as the gender neutral term. Anyway, we had a flurry of nieces and nephews (I’m not going to use Niblings as it makes them sound like a snack to have with evening drinks!) in 2014 and obviously each one required their own PatternPiper baby blanket. 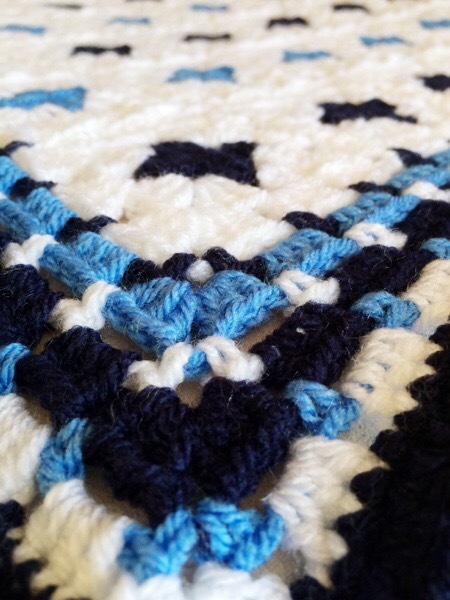 My brother’s daughter was first on the scene in June and she inspired the Evie Star Blanket. 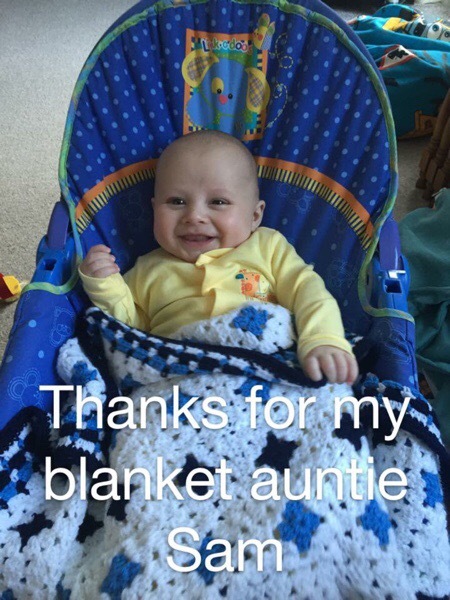 Then my sister’s son arrived in August and the Hunter Rainbow Blanket is all down to him. Finally, my brother in law’s second son made an appearance in November and the Monty Baby Blue Blanket was made for him. 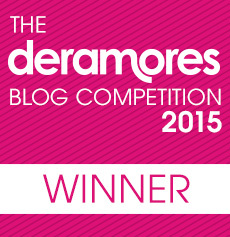 A rough idea of how I made it…. It’s made from 54, 2 round granny squares. On half of them round one is dark blue and on the other half, round one is made with a lighter shade of blue. Round two on all squares is white and I joined the squares as I went. 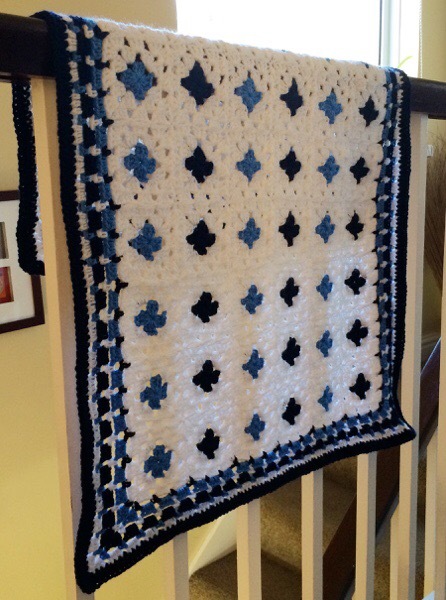 Once all the squares were joined I made 1 double crochet (UK terms), chain 3 in each space in dark blue all the way around. 1 double crochet, chain 3, 1 double crochet in the corner spaces. The next round is 3 half treble crochet, 1 chain in each chain 3 space of the previous round using the lighter blue. 3htr, 3 ch, 3htr in the corners. 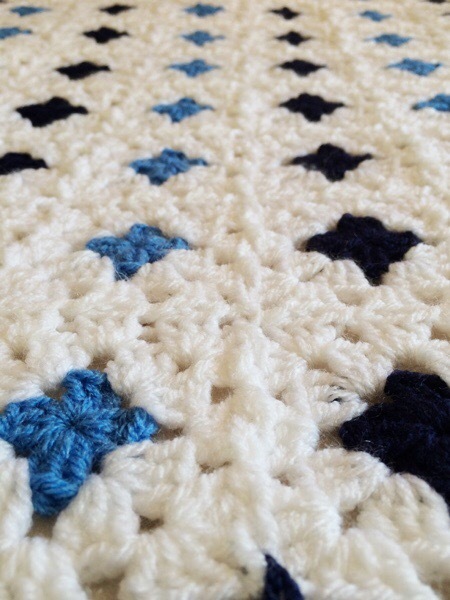 I repeated border round 1 but in white. I repeated Border Round 2 but in dark blue. 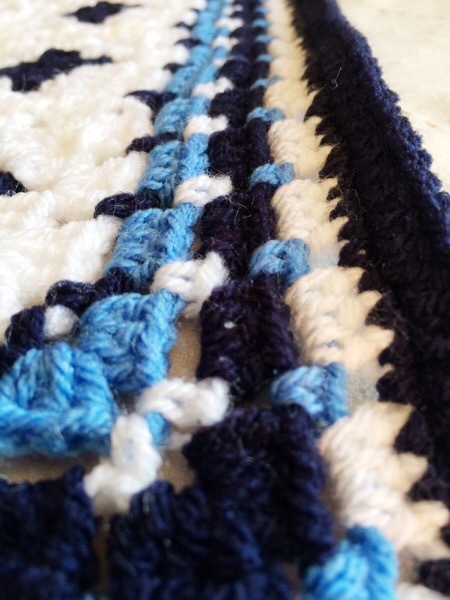 The final round was 1 half treble crochet in each stitch and space in the dark blue. I used Stylecraft Special DK in White, Midnight and I think the lighter blue was denim. I used a 3.5mm hook. It’s only a dinky blanket. 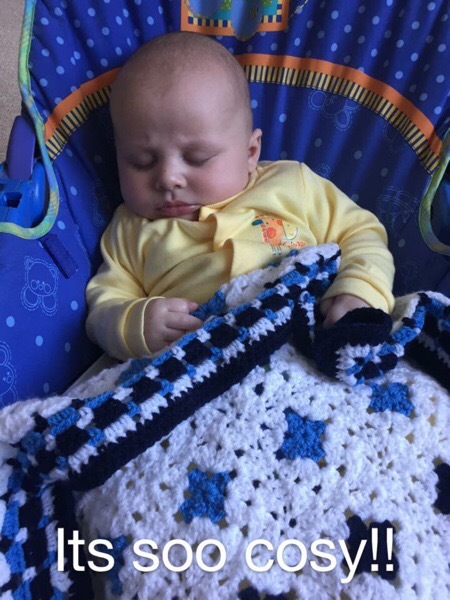 My other nephew has a crochet blanket (not one of mine as it was pre-PatternPiper) that gets taken everywhere so I thought if the newbie does the same it needs to be a practical carry around size – this one is just right. This blanket satisfied the impatient crocheter in me as it was super quick to make. I get bored if a project takes too long and then I end up with lots of unfinished pieces all over the place. I think the little guy liked it!